Sunday September 16th 1894 It was a fine morning Alice and I went to church. When we got home soon got dinner. In the afternoon Ott & Fanny came out with the baby. John Hatt & Edith were out for supper. After helping do up the evening. work I wrote some before bed-time. 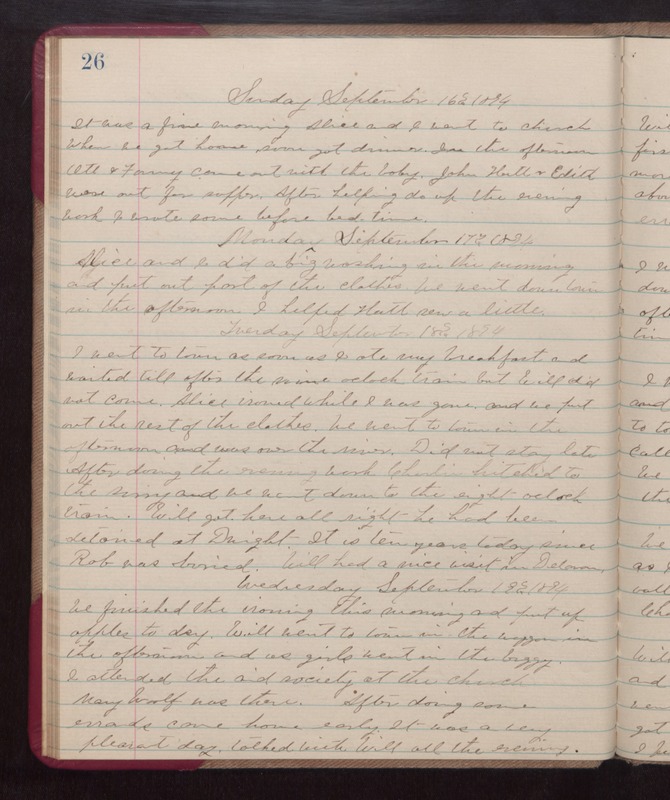 Monday September 17th 1894 Alice and I did a big washing in the morning and put out part of the clothes. We went down town in the afternoon. I helped Hatt sew a little. Thurday September 18th 1894 I went to town as soon as I ate my breakfast and waited til after the nine oclock train, but Will did not come. Alice ironed while I was gone and we put out the ret of the clothes. We went to town in the afternoon and was over the river. Did not stay late. After doing the evening work Charlie hitched to the surrey and we went down to the eight oclock train. Will got here all right he had been detoured at Dwight. It is ten years today since Rob was buried. Will had a nice visit n Delavan. Wednesday September 19th 1894 We finished the ironing this morning and put up apples to day. Will went to town in the waggon in the afternoon and us girls went in the buggy. I attended the aid society at the church. Mary Woolf was there. After doing some errands came home early. It was a very pleasant day. talked with Will all the evening.